2 Shadows On sunny days, my shadow walks with me. 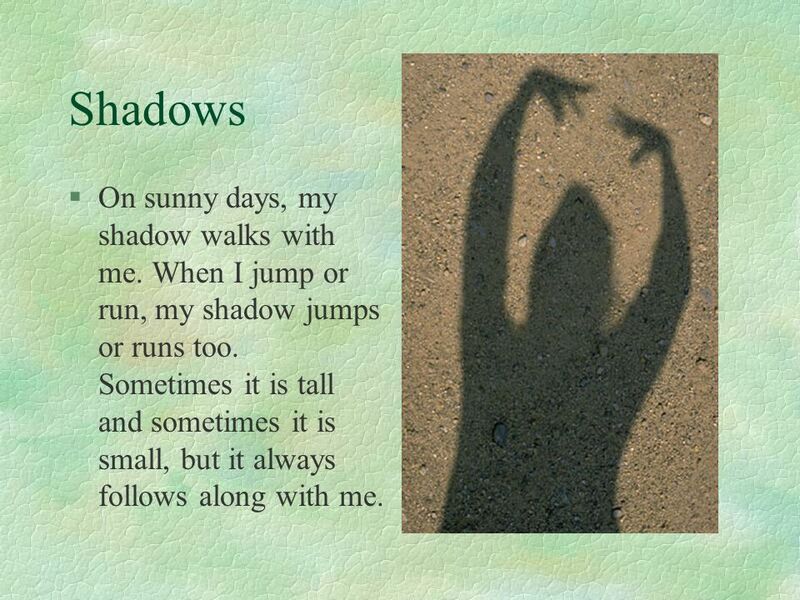 When I jump or run, my shadow jumps or runs too. Sometimes it is tall and sometimes it is small, but it always follows along with me. 3 Houses have shadows. 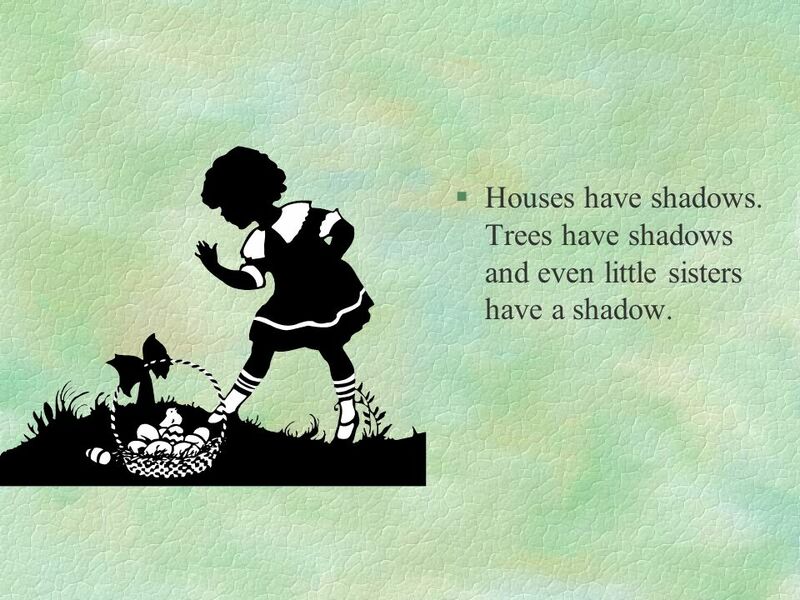 Trees have shadows and even little sisters have a shadow. 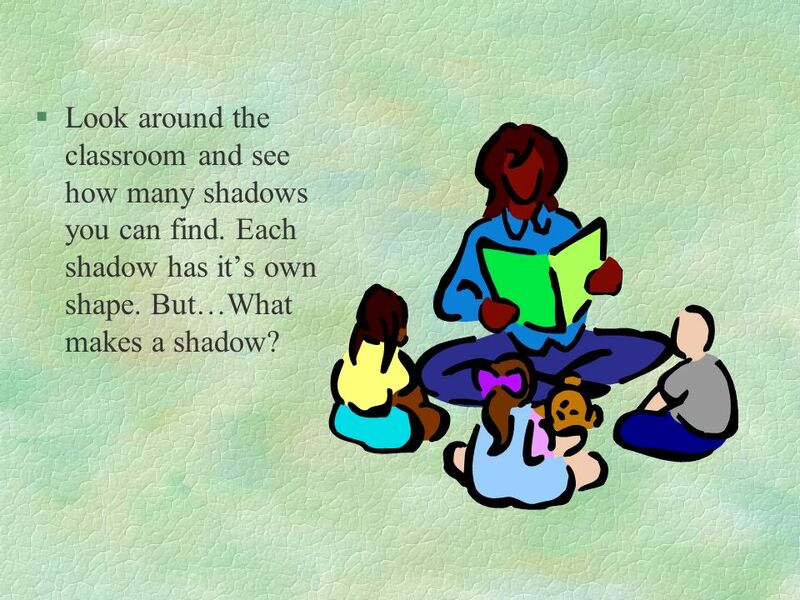 Look around the classroom and see how many shadows you can find. Each shadow has it’s own shape. 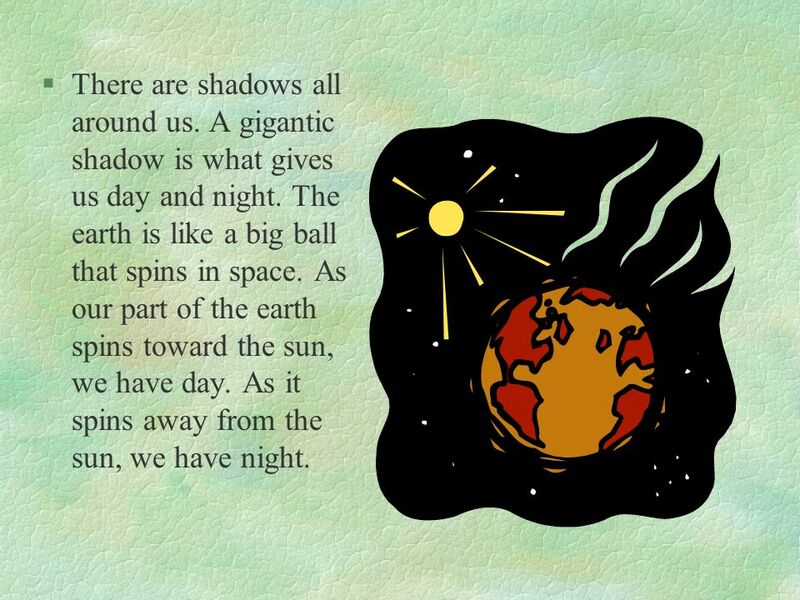 But…What makes a shadow? Shadows are made when light is blocked from a surface. 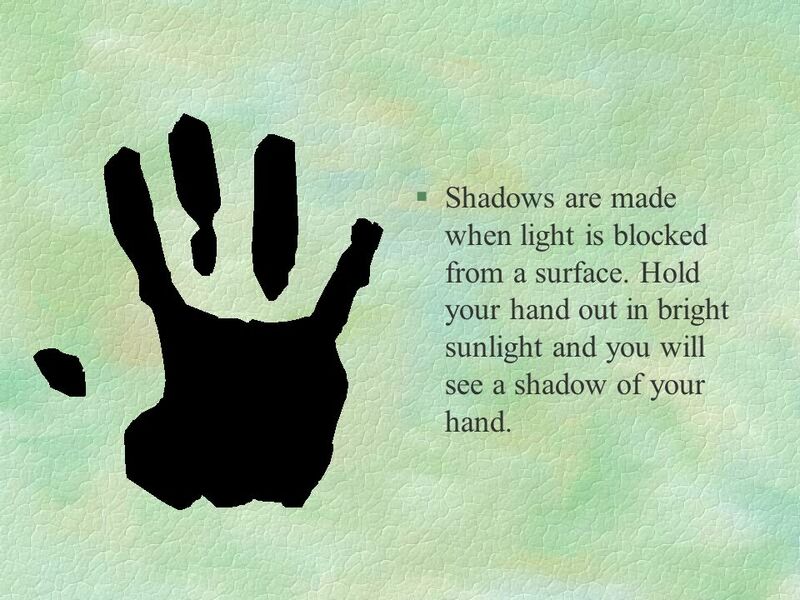 Hold your hand out in bright sunlight and you will see a shadow of your hand. 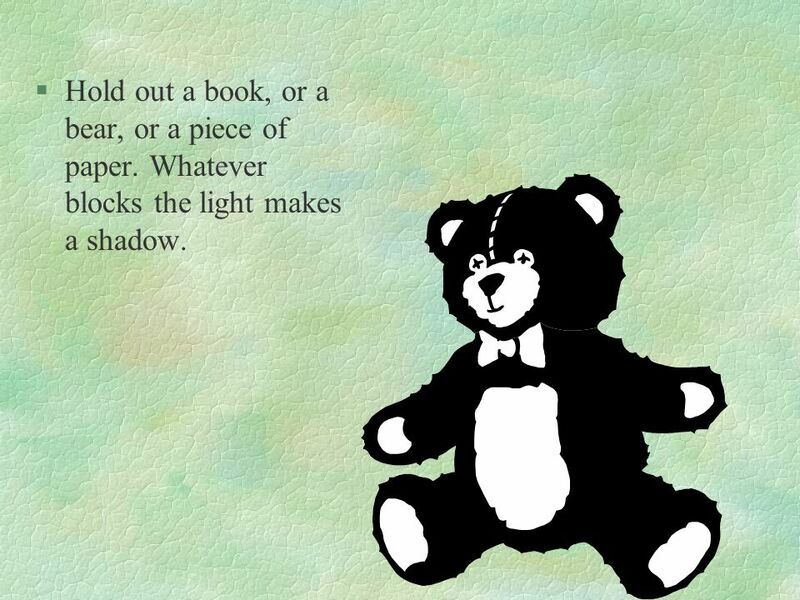 Hold out a book, or a bear, or a piece of paper. Whatever blocks the light makes a shadow. 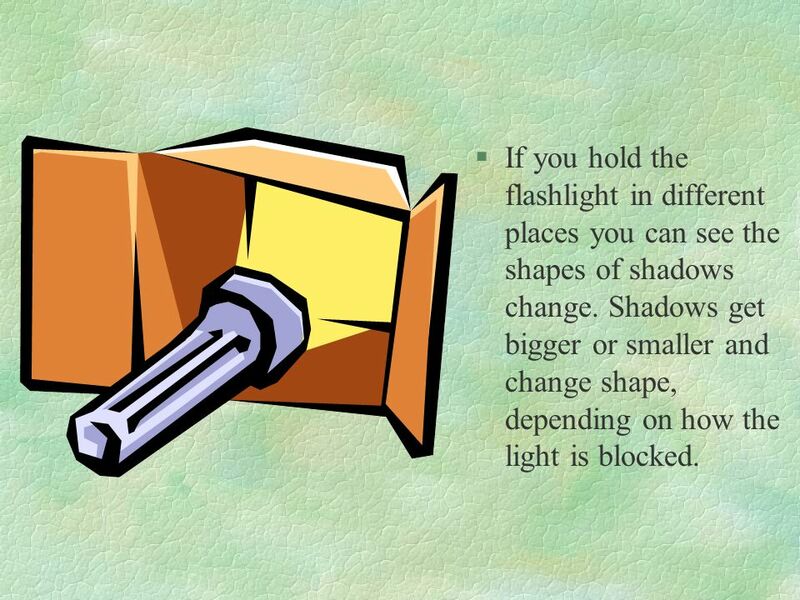 7 If you hold the flashlight in different places you can see the shapes of shadows change. Shadows get bigger or smaller and change shape, depending on how the light is blocked. 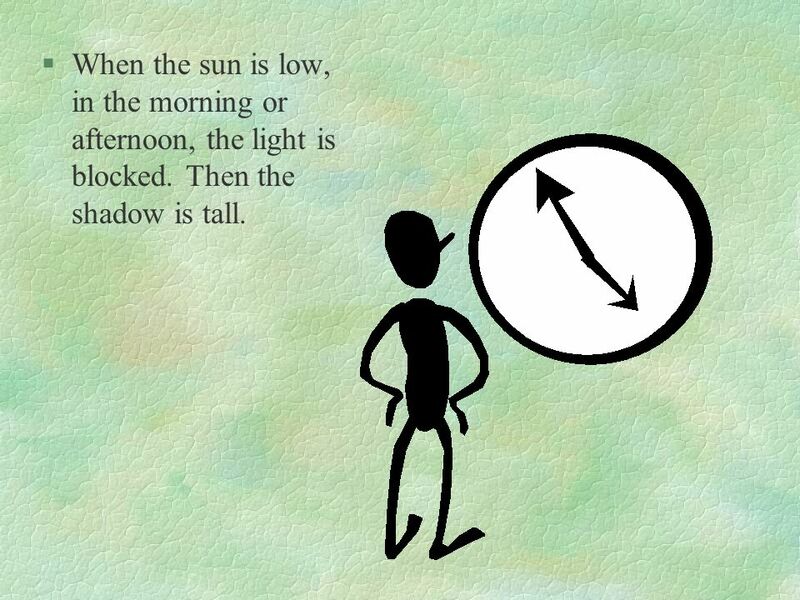 When the sun is low, in the morning or afternoon, the light is blocked. Then the shadow is tall. 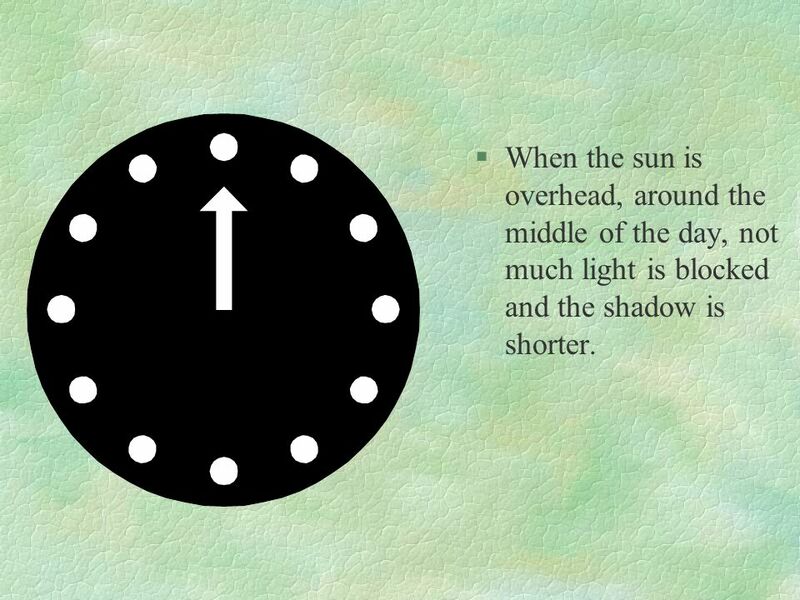 9 When the sun is overhead, around the middle of the day, not much light is blocked and the shadow is shorter. Shadows can also move. Try catching them in a game of shadow tag. Shadows tell us what shape something is. 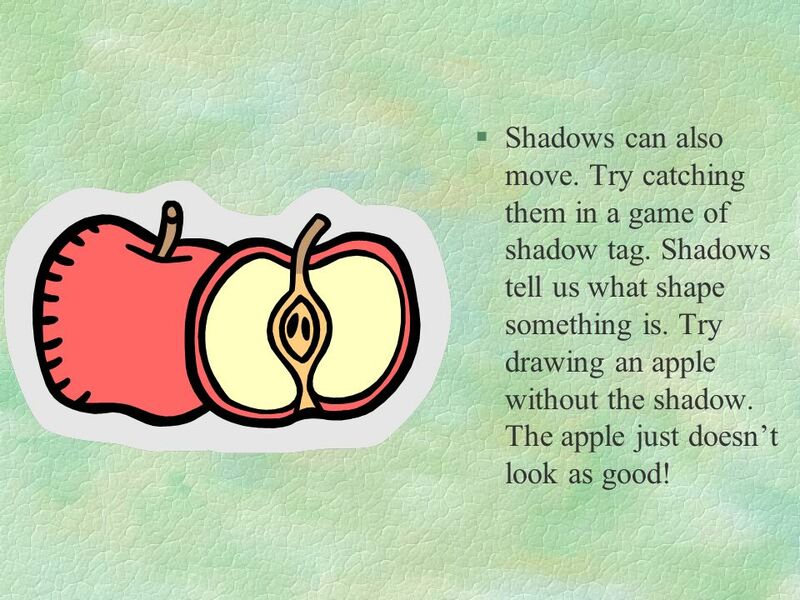 Try drawing an apple without the shadow. The apple just doesn’t look as good! There are shadows all around us. A gigantic shadow is what gives us day and night. The earth is like a big ball that spins in space. As our part of the earth spins toward the sun, we have day. As it spins away from the sun, we have night. The moon has a shadow too. The moon circles the earth. One half of the moon always faces the sum. It is lit up. The side away from the sun is always dark. It is the shadow side of the moon. The moon takes many days and nights to circle the earth. 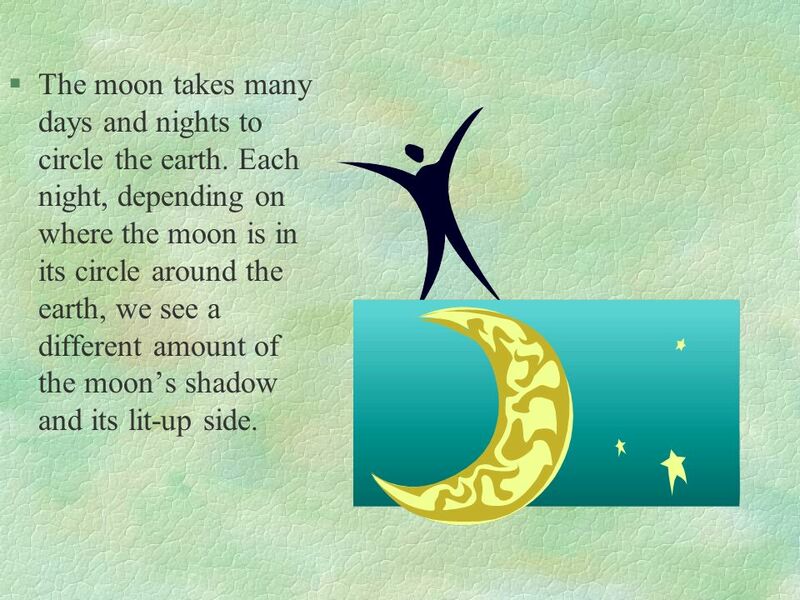 Each night, depending on where the moon is in its circle around the earth, we see a different amount of the moon’s shadow and its lit-up side. 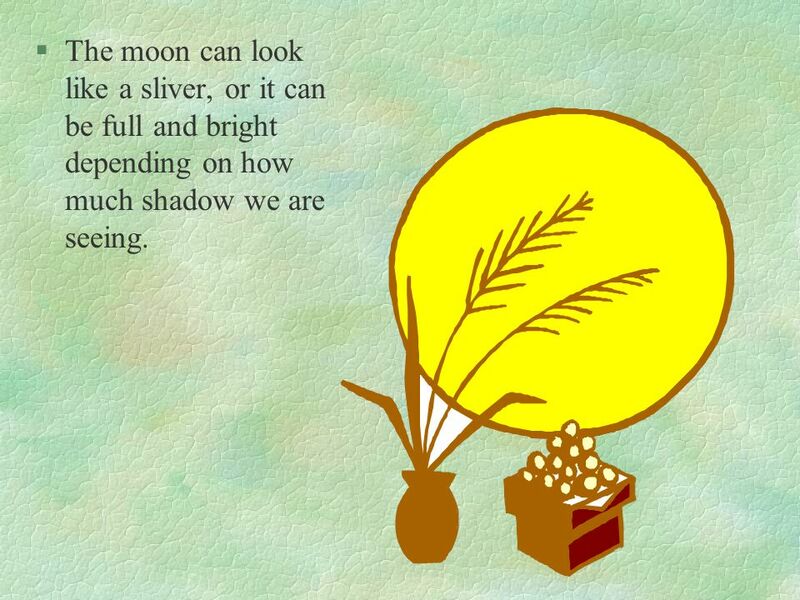 14 The moon can look like a sliver, or it can be full and bright depending on how much shadow we are seeing. 15 As the moon circles the earth, once in a while it gets right between the sun and the earth. Then the earth is in the moon’s shadow and we have an eclipse. Eclipses don’t happen too often. 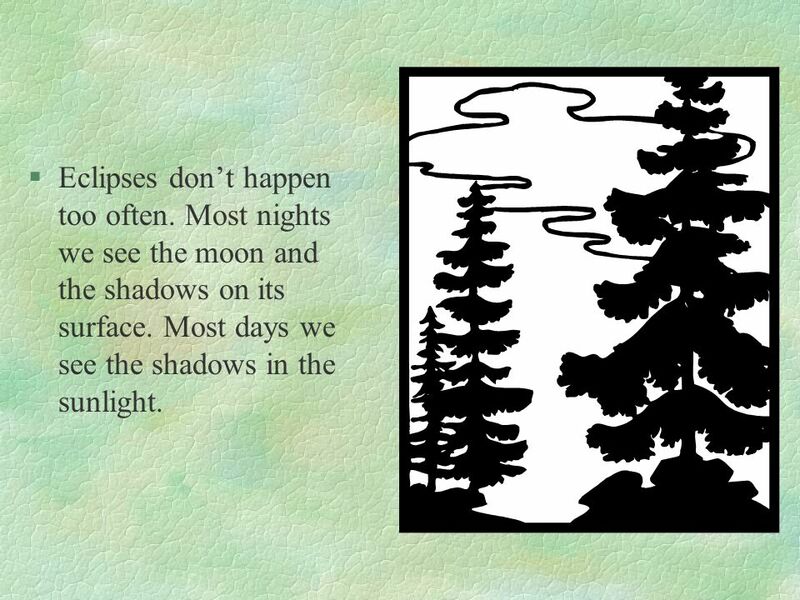 Most nights we see the moon and the shadows on its surface. Most days we see the shadows in the sunlight. 17 There are short shadows, tall shadows, round shadows, fuzzy shadows, and shadows that move. 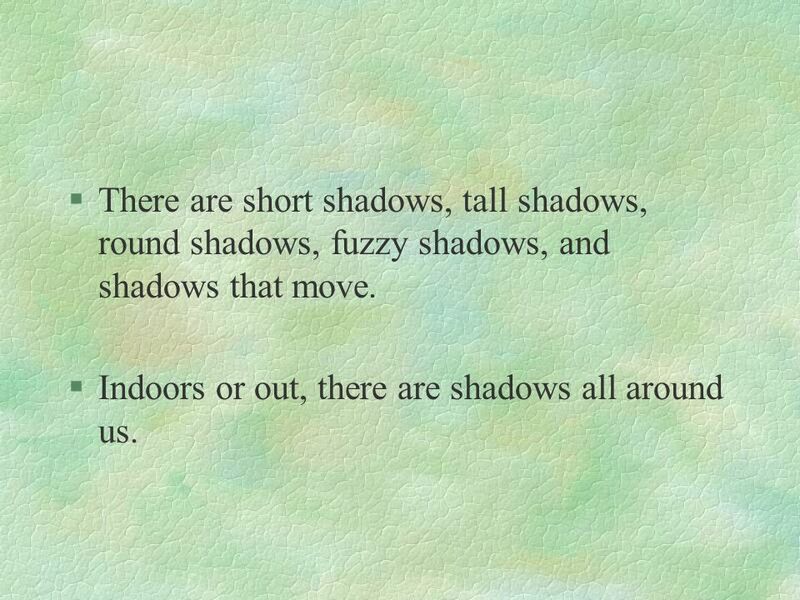 Indoors or out, there are shadows all around us. 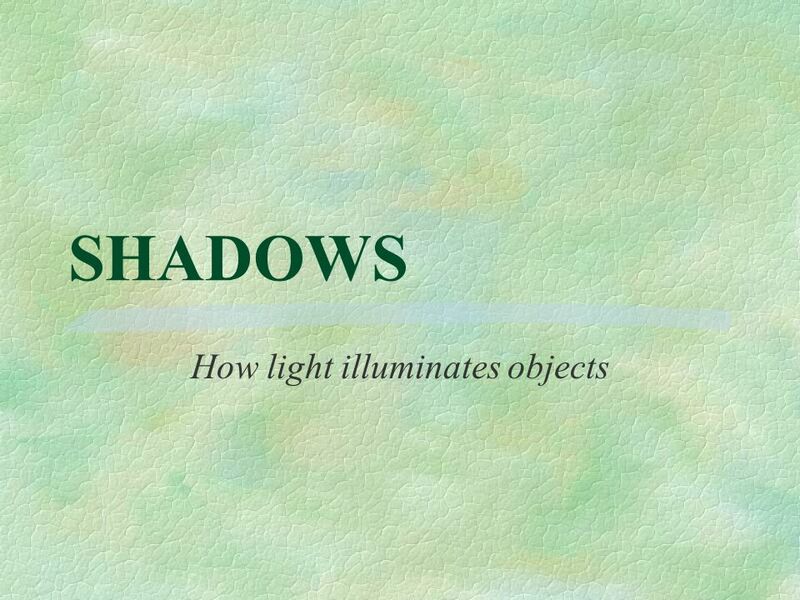 Download ppt "How light illuminates objects"
Sunlight and space travel. 2 Distances If you drive on a motorway at 70 miles per hour  in one hour you may get to Stafford.  Steady speed! If you keep. Phases of the Moon Created by Mrs. Bodine-Donahue. Completed in class on Friday, January 10. SUN, EARTH, & MOON FOCUS READING PACKET. © A. Weinberg SOL 3.8 By Ms. Weinberg. © A. Weinberg When you look up in our night sky, you will see the moon! The way that the moon looks changes during. Stars and Planets By: Janet Borg. Stars and Planets. Come and Explore the phases of the moon.. Reflection: How does the moon move? Does the moon rotate? How long does it take for the moon to go around the. Moon Phases. Rules of Moon Phases  The moon has 8 phases. 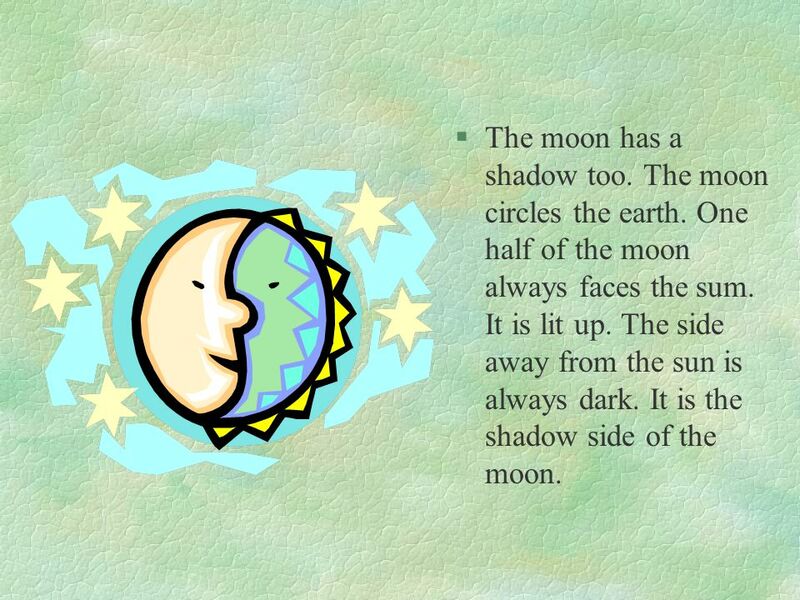  The moon has phases because it revolves around the Earth  As the moon moves, the amount. Moon Phases. What Causes the Phases of the Moon? It’s fascinating to watch how the moon changes over a month. For a couple days, it is a full bright circle. It takes 29 ½ days – almost 1 month – for the moon to move (revolve) around the Earth. Phases of the Moon NSF North Mississippi GK-8. The Moon By: Cammie Goodman. Moon Phases. Half of the Moon is always lit up by the sun. 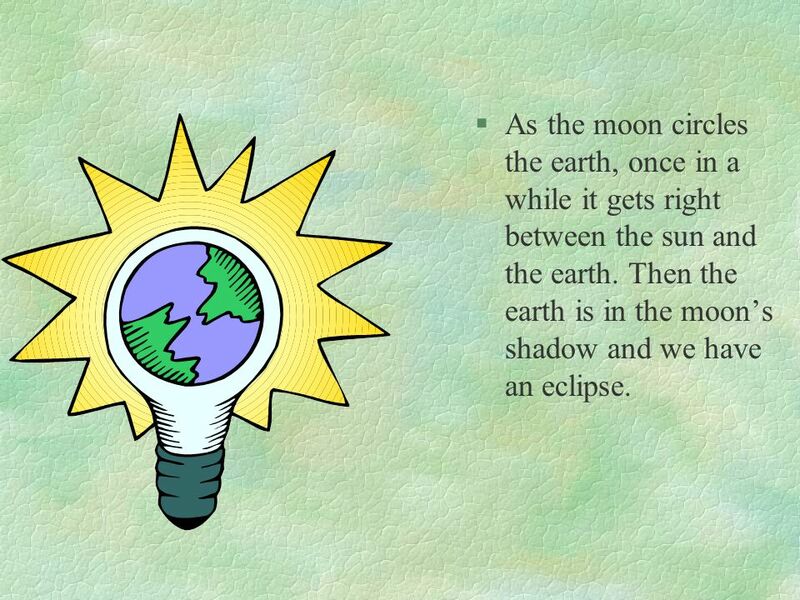 As the Moon orbits the Earth, we see different parts of the lighted area.